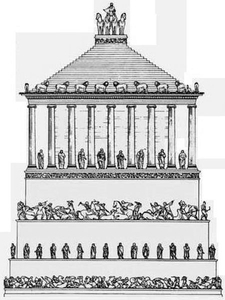 In order to describe the architecture of the Mausoleum of Halicarnassus, the famous tomb of King Mausole, which has become one of the seven wonders of the world, we must rely on the documents left to us by geographers and historians. most of them documents from the testimony of others. It is therefore necessary to be relatively cautious, the risks of errors are great, but fortunately scientists and archaeologists have succeeded in offering us a relatively reliable architecture of what this mausoleum was. Here it is represented. He was protected at the four corners by stone statues of soldiers on horseback. The body of the tomb was in the shape of a truncated pyramid, but a pyramid so little inclined that it looks like a cube. In fact it is a parallelopiped, the base measured 38.4m by 32.5, for 13m high. 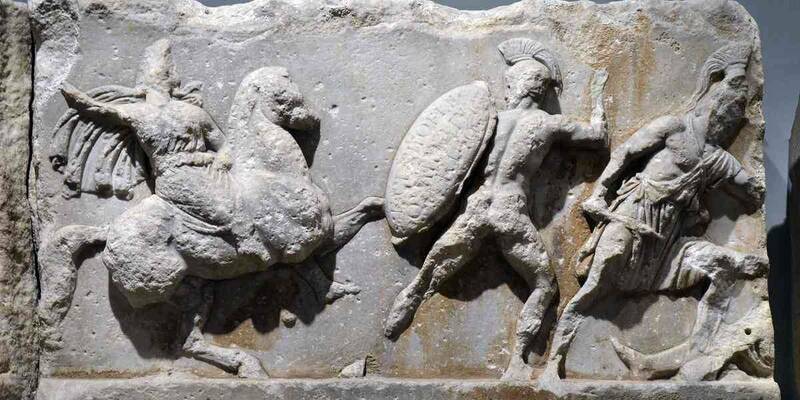 The upper and lower part of the tomb was decorated with a frieze showing battles of centaurs with lapiths and the Greeks in combat with the Amazons, a race of warrior women from the Black Sea coast who lived 1000 years BC. 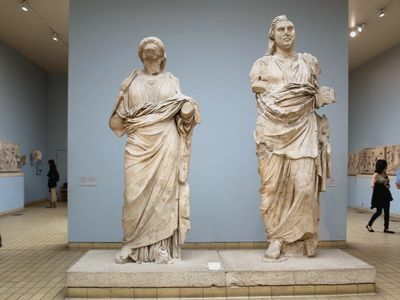 The nineteenth-century archaeologists brought back large portions of the frieze in England, and were presented at the British Museum. Along the wall of the tomb were two rows of decoration. 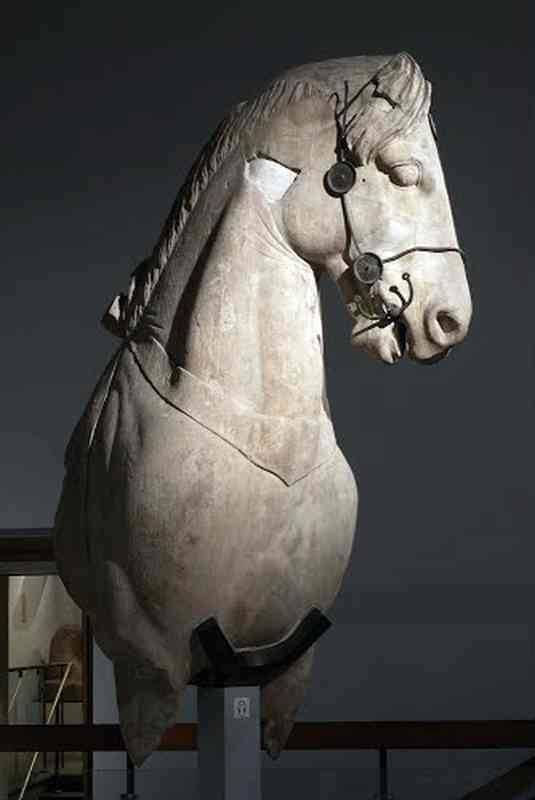 The lowest was made of statues of Gods and Goddesses, the second was statues of equestrian fights. Finally, at the top of the tomb, there was the second frieze. Then begins the second part of the mausoleum, the colonnade. It was made of 36 fine columns 12m high, they were spaced about 3m apart. 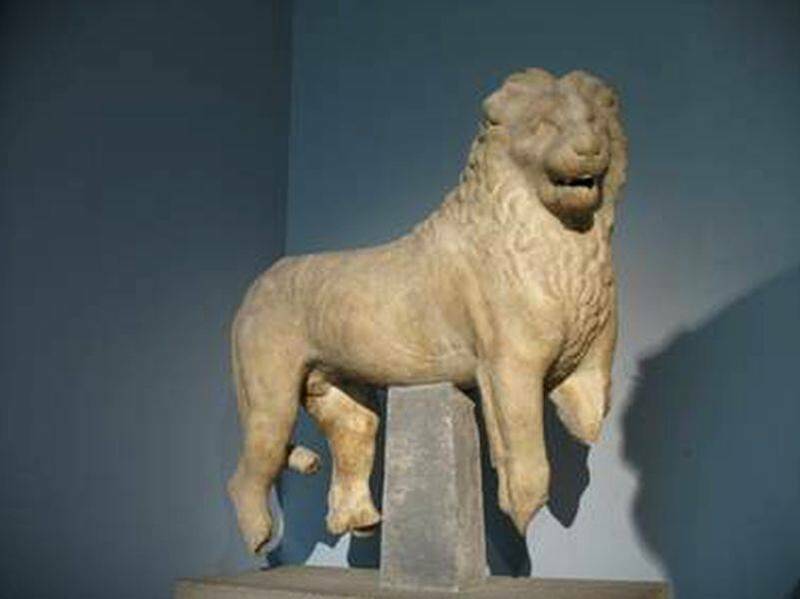 Behind the columns stood a solid stone block of cella type bearing the weight of the massive roof of the tomb. Between each column was placed a statue representing a human being. If one can not necessarily be sure of who it was, specialists agree that the members of the royal court would have been represented here. The roof, at 24 degrees, was pyramid-shaped. At its base was a row of lions sculptured in the stone, and at the top was the quadriga (chariot with two wheels drawn by four horses) which was occupied by a statue of Mausole. 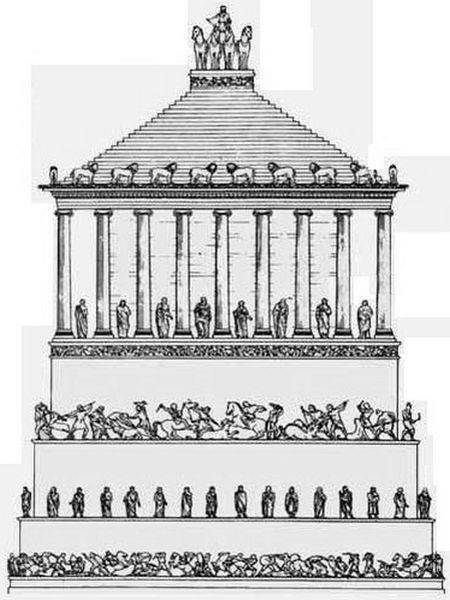 The quadriga at the top of the roof is described in the section devoted to the mausoleum.